Shy Guys, also known as Red Mini Shy Guys, are Shy Guy toys appearing in the Mario vs. Donkey Kong series. They act similarly to Shy Guys from Super Mario Bros. 2, simply patrolling left to right on a platform. Touching them from the sides is harmful for both the Mini toys and Mario. They are among the weakest enemies in the series and can be defeated with any form of attack available in a game, of which the most commonly seen are Hammers. 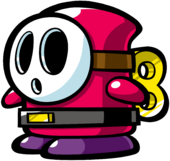 As they are basic enemies, Shy Guys often appear in early levels and only occasionally return in later levels. It is unknown if the Mario Toy Company created these toys, along with Mario's other windup foes. 1.4 Mario vs. Donkey Kong: Mini-Land Mayhem! In Mario vs. Donkey Kong, Mario can ride them or pick and throw them at other enemies to defeat them (as in Super Mario Bros. 2). They can also be defeated by throwing another enemy or an object, such as a bin or key, at them. Shy Guys debut in the first level of the game, where they patrol areas in front of bins and that can be used to attack them, and continue to appear occasionally in subsequent levels. Exclusively in the Spooky House boss stage, Level 4-DK, Shy Guys are transformed into Polterguys and vice versa by Donkey Kong's Color Switches. Remarkably, throughout the entirety of Level x-7, a Shy Guy needs to be used to cross beds of spikes. In Mario vs. Donkey Kong 2: March of the Minis, Minis can ride Shy Guys to safely cross certain hazards, although touching the sides of a Shy Guy (or any other enemy) will instead instantly break a Mini. A Shy Guy in Mario vs. Donkey Kong: Minis March Again! In Mario vs. Donkey Kong: Minis March Again!, Shy Guys, also dubbed Spear Guys, additionally wield spears, but only hold them upright, making them harmful to touch from above. Unique to Minis March Again!, upon activation of a red Color Switch, Shy Guys transform into stationary solid blocks. 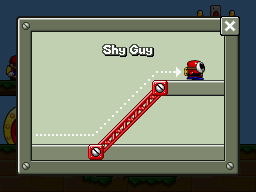 When in this state, Shy Guys can be used as a step or bridge to cross harmful areas. Shy Guys can be defeated with hammers. They first appear in Room 2-7 of Sandstone Stroll, but are more prevalent on the Jungle Rumble floor. Shy Guys revert to their original appearance in Mario vs. Donkey Kong: Mini-Land Mayhem!, no longer holding spears. Despite the change, they remain harmful to touch from above, unlike in Mario vs. Donkey Kong 2: March of the Minis. Shy Guys appear early in the game, starting with Area 1-5 where the player learns that it is possible to destroy enemies using Hammers. In this game, they can also be defeated by shooting into one from a Cannon or sliding into one from a slope. Later in the game, in Super Skywheel, Shy Guys can fill Shy Guy Blocks, becoming solid platforms. Shy Guys in Mario vs. Donkey Kong: Tipping Stars act and look the same as in Mario vs. Donkey Kong: Mini-Land Mayhem!. They are also introduced in a similar stance in Level 1-3, where the player can pick up a pair of Hammers and destroy the Shy Guy present in the level. In Mini Mario & Friends: amiibo Challenge, Shy Guys once again appear as enemies. In addition to using Hammers or a slope slide, Shy Guys can be defeated by eating them with Mini Yoshi. Mario vs. Donkey Kong 2: March of the Minis! Heihō Mechanical Shy Guy; katakata being the sound of a working mechanism. This page was last edited on April 16, 2019, at 17:15.